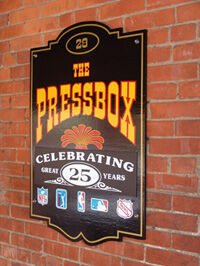 Famous since 1984, The Press Box is a sports bar and restaurant located at 29 East First Street, in Oswego, New York. Conveniently located in the heart of downtown, adjacent to area hotels, shopping, parks, and the Oswego Harbor, the restaurant is a popular venue for local and visiting patrons. 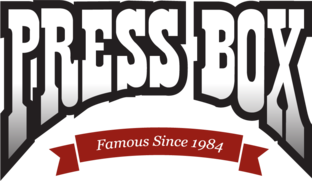 The Press Box offers a wide assortment of pub-style menu items including: burgers, paninis, wraps, entrees, grilled pizza, salads and more. Plus, our large screen televisions, Quickdraw, diverse music, and a sports themed interior design and environment complement the experience for our patrons.Stop in and visit us today or call for reservations or take-out at (315) 343-0308!